Happy New Year! 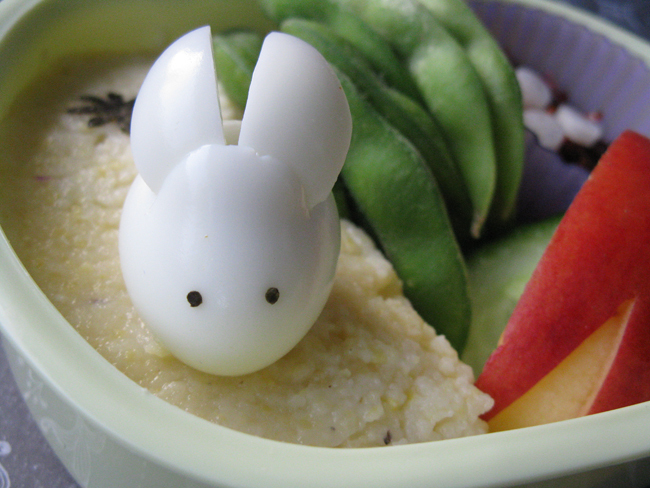 To celebrate the beginning of 2011, The Year of the Rabbit, I made a very bunny bento. Technically, The Year of the Rabbit will not start until February 3rd. We are actually still in The Year of the Tiger. I am looking forward to this less aggressive year, myself. In this bento: creamy polenta (I used Martha Stewart's easy baked polenta recipe), a rabbit quail egg, nori flower, steamed edamame, stir fried carrots and purple cabbage topped with lotus rootlets, cucumber slices, and an apple rabbit made with an Arkansas Black Apple from Walker Apples. I made the quail egg rabbit by hard boiling a quail egg, then slicing a small section off of one side. I cut that section in two pieces, then inserted those slices into an angled slit on the top of the egg. The nori eyes were punched out with a tiny hole punch. I found these lotus rootlets in brine at Asia Mart on Guerneville Road in Santa Rosa. They have pretty much no flavor, but such a cool shape. A few little slices of rootlet make small snowflake like patterns. Loving the quail egg rabbit! I wish I could get my hands on quail eggs. 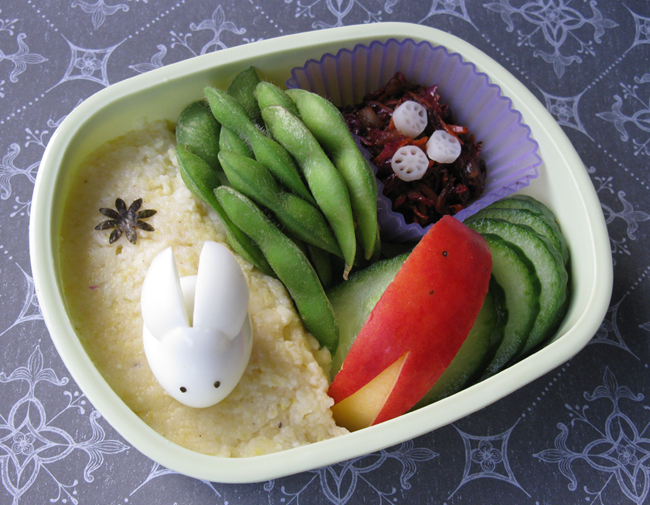 I'm waiting for my rabbit bento box to arrive in the mail before I make my official Year of the Rabbit Bento. Sonoma-san, this is as cute as always. I just love your Bento...and this rabbit is really wonderful! Thanks so much Jessica! 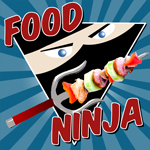 Are there any asian stores in your area? That's where I get my quail eggs. You can also find them occasionally at farmers markets. 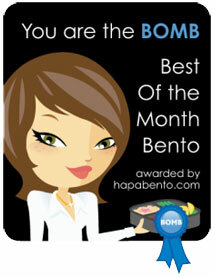 Congrats on your new bento box, sounds fun! Danke sehr, Ty! Ich wuensche Dir auch Alles Gute Zum Neu Jahr! There's a Korean supermarket about 45 minutes from where I live. I never thought to look there! That's where I usually have to buy mirin, soba, and other things that my local grocers don't have. Next time, I'm bringing a cooler for those quail eggs! Score! I hope they have quail eggs. Check to see if they have other fun fresh food items like purple sweet potatoes and bitter melon. Good luck, Jessica! I want to make the bunny so bad! I'm holding out for Feb 3 for my New Year bentos, though. I think my son is going to love this! oh..cute rabbit! I can't wait to start my Year of Rabbit bento after seeing your quail egg rabbit....it's really nice! May be I should have a try with quail egg too...heheh. That bunny egg is SO cute! And the teeny lotus rootlets are adorable! I love the name rootlets. Hehe! Happy new year Michelle!! 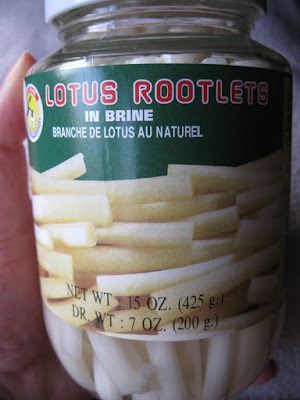 So, do you think those lotus rootlets would keep in the fridge for ages and ages, like pickles? If so, I'd pick up a jar just for garnish. Those are really cool looking. Thanks Emily! I am sure you will make some great Year of the Rabbit bentos. :) Happy New Year to you too! Thanks sheri! I know, rootlets, rootlets, heh heh, so fun to say! I just about flipped when I saw the jar of them, super cute. I bet the jar will last for some time, dragonmamma. They are in a salty brine, so I bet the contents will be good for at least 6 months to a year. Easy garnish! Thanks so much Kids Dream Work! Bunnys are so much fun to put in a bento, this one was really easy to make.